We have been established in London offering our deep tissue, Raynor Massage training courses since 2007. 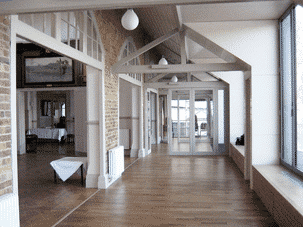 Based in the prestigious Thames Rowing Club in Putney, we have 5 day Certificate and Diploma courses. 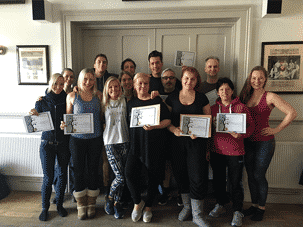 These massage courses are run by Dave Taylor who is an Advanced Raynor Massage practitioner. Dave was once a student himself of this exact training, attending on 2010. He now has his own clinic in Sutton where he offers deep tissue therapeutic massage. 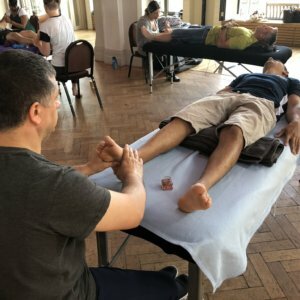 Dave is keen to share with you not just these amazing deep tissue massage techniques but also the business side of things to enable you to also get started as a professional massage therapist. Raynor Massage is a whole body therapy that was devised by naturopath, Brandon Raynor. 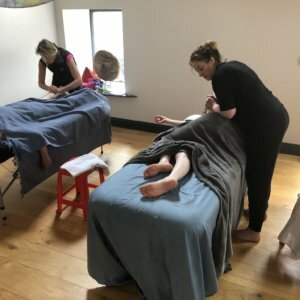 Taking influence from many traditional eastern massage therapies, like Thai Massage, Shiatsu as well as modern reflexology with a fusion of Western theories making an intensive and hugely effective massage therapy. This is perfect for the growing trend here in the UK of clients that are no longer looking for a ‘fluffy’ relaxing massage and would rather spend their money on a treatment that not only feels like it’s doing something but also makes a tangible, physical difference. 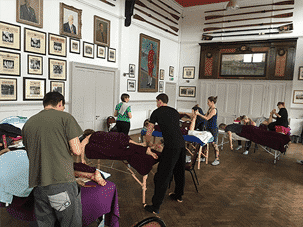 We offer these massage training courses in London throughout the year at the Thames Rowing Club in Putney. 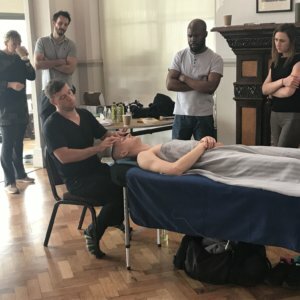 If you are looking for Sports Massage training in London then you will find that Raynor Massage is the fast-track solution to an exciting new career. We take a holistic approach to massage therapy and treat the whole body rather than just individual symptoms. So for example we recognise that stiffness in the lower back could well be caused by tension further down that is being held on the hips, hamstrings or even feet. 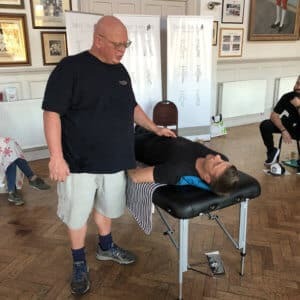 We use a combination of sports massage techniques as well as a range of stretches and adjustments with the single focus of removing all residual tension from the body. So those looking for a Sports Massage training course in London should consider the Raynor Massage Diploma. You can read more about Sports Massage courses here. Thames Rowing Club has been in existence for more than 150 years, founded in 1860. The club is located in West London on the Putney Embankment and caters to all ages and skill levels, juniors to veterans and novices to international competitors. Thames is now considered to be among the largest rowing clubs in the UK as well as one of the most successful. Many describe the club as being very welcoming and friendly. 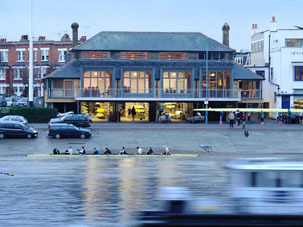 The Clubhouse at the Thames Rowing Club, Putney in London has been newly renovated with a great bar where you can socialize with other members whilst enjoying a fantastic view of the river. You will find a lot of the athletes congregating at the bar after training or lounging on the sofas nearby. It’s a fun place to enjoy a drink during the week after training. Many house members stop by the bar at the weekends after morning training just to relax by the river with a drink. What was then called the City of London Rowing Club was founded in 1860 by a small group of salesmen and clerks working in London’s rag trade. They were initially based at Simmons Boathouse in Putney, in the spot where Chas Newens Marine Co. is now. They also kept a room at Putney High Street’s Red Lion Hotel. Initially, their objective was fairly modest, to create an organization to promote the pleasure and exercise that rowing provides. Within a short period of time they had changed the name to Thames Rowing Club and by 1864 interest in competition rowing was gaining traction, especially when Thames won its first race, which was against Greenwich’s Excelsior Boat Club. These were the small beginnings of what would eventually be an enormously successful rowing club and one of the largest in Britain. During these early years, the idea of a “great Victorian amateur” predominated. Many members of the Thames Rowing Club, Putney in London pursued all kinds of sports, which allowed the club to extend its influence beyond just rowing. Starting in 1866, Thames put together cross-country races in the areas of Richmond Park and Wimbledon Common. These were apparently the very first open cross-country rowing events in Britain and became part of the winter training ritual for oarsmen. Eventually, the Thames Hare & Hounds Club was founded as a result of these events. This was the first club established for the purpose of promoting cross-country races. In time the Thames Hare & Hounds Club became more influential and actually played a vital part in the formation of the Amateur Athletics Association. The Thames training ritual for rowing added boxing to the mix with a boxing ring often being set up in the hallway of the clubhouse. One particular member stood out. George Vize was a member of 5 winning crews at Henley. Then, in 1878 he became Britain’s amateur heavyweight boxing champion. He then went on to help found the Amateur Boxing Association. Thames really blossomed during the next 20 years, recording a total of 22 wins at Henley, all by 1890. These included 4 victories in the Grand Challenge Cup for men’s eights, Henley’s most prestigious award. Today, Thames Rowing Club is flourishing and as active and influential as ever.